It's that time of year again. The calender turned over and the Leafs are in the middle of a swoon that pulls them out of playoff contention. The Leafs are 5 points back of the 8th place New York Rangers (who also have four games in hand). A big win streak might change things but right now the Leafs look like they are headed for another failed season and hopefully management recognizes it at the deadline and moves some bodies out to restock the cupboard. This is the 1st of a two year transition in how the draft lottery plays out. This year there is a slight weighting away from the 30th ranked team getting the #1 pick. The same rules apply overall as you can only move up to the #1 spot or be moved down a single spot if another team wins the lottery behind you. (Next year there is a lottery for the top 3 draft slots). This is expected to be a very deep draft, particularly in the 1st round. Plenty of good centers outside of Connor McDavid and Jack Eichel. A lot of size in the top 15 ranked prospects as really only Mitch Marner and Nik Merkley fall under 6'0" in their current rankings. I think Marner at the very least will break 6 feet by the draft combine, not sure on Merkley. Although IMO this a little early to write it all off now. If we cant win a couple in the near future, this may be something to look at. I still can't get over it -- is Edmonton serious in being that pathetic? My goodness. Leaf Tank Nation lives on for another year. The playoffs are slipping away, so might as well get as high a pick as you can in this supposed deep draft. They better not gum this with one of those useless late surges. I think they will. When Lupul returns and the schedule gets a bit easier they'll go on a bit of a run. They should move Santo, Franson and Winnik. Hopefully for a 1st some 2nd's and a 3rd and use the rest of the season to see what they've got on the Marlies (give Ashton a real look, amongst others). That should make them bad enough to avoid winning too much. How does a team even have 4 games in hand right now? The schedule this year seems strange. They need to win about 25/26 of their remaining games to make it based on current projections. Assuming 93 points will be the cut-off again, the Leafs will need to play .621 or better hockey to make it in. Seriously, stick a fork in it guys. ... and then I realized that Boston is in 8th place and on pace for 98 points. That's insane, just like anybody who thinks the playoffs are still in reach. Need to get into top 10 and hope someone takes Crouse before the Leafs pick. Want to be sure to get a top 10 pick in a deep draft? In fact, want to stockpile more than one pick in the first round? There's only one way, folks. 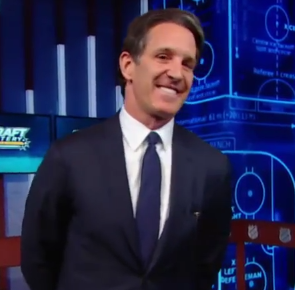 Get on with it, Shanahan. Yup, a few nights ago the echo chamber was predicting 97pts as the 8th place pace. C'mon guys...everyone knows all of the following are coming. 1. Another 10 out of 12 run right before the trade deadline making management think it has a shot. Nobody of any significance gets moved. 2. This will be followed by another 2 wins in the 10 games immediately after the trade deadline. It will then seem like we are in line for a top 10 pick. 3. But then, a win streak where nobodies like Carter Ashton/Troy Bodie/David Clarkson score boatloads of useless goals in that stretch to end the season on an upnote and push us outside a top 10 pick. Sorry, you lost me when you had Clarkson scoring a boatload of goals, useless or otherwise. but I got the "nobodies" part right...give me that at least! The above has been status quo for the past while I'll give you. But if they play the same style of hockey they have been attempting since the coaching change, there is no way number 1 will happen. Is there a way we could make a drinking game out of this scenario somehow? It seems like the only way to survive what we know is coming in the next 3 months.